Swallow Barn was originally a squash court and stables once belonging to the next door manor and originally owned by Peter Gabriel’s grand parents and now a Nursing Home. It is full of family memories and old fashioned charm and has been run as a bed and breakfast by the Careys for approximately 17 years. There are mature trees in the garden with a summer swimming pool and paddock beyond where friends graze their ponies. Given the hushed tranquility you are surprisingly close to the airports and M25. 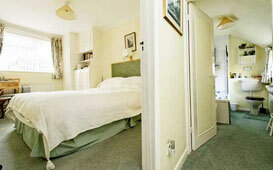 The bedrooms are well sized, one has its own entrance, another the use of a sunny sitting room and the third a balcony. 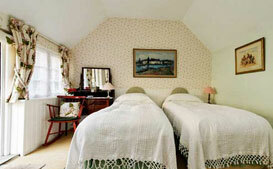 The beds are firm and have super duvets, but sheets are available in each room. The garden views are pretty and breakfasts both generous and scrumptious. You can walk to the restaurants and pubs which are within half to three quarters of a mile. Many of our guests return on a yearly basis, and some even monthly and weekly. 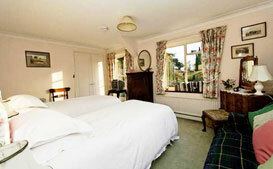 All rooms have tea and coffee making facilities as well as a TV. There is private parking available for all guests staying at Swallow Barn. Arrival time is between 6.00 and 8.00 p.m and departure by 10.00 a.m unless other arrangements are made with Joan Carey.